WASHINGTON, Jan. 22 (Xinhua) -- The U.S. Senate will vote on two competing bills Thursday in an attempt to end the month-long partial government shutdown, Republican and Democratic Senate leaders said Tuesday. The two spending bills include one with 5.7 billion U.S. dollars to fund the U.S.-Mexico border wall demanded by President Donald Trump, and another that extends funding for closed agencies until Feb. 8. 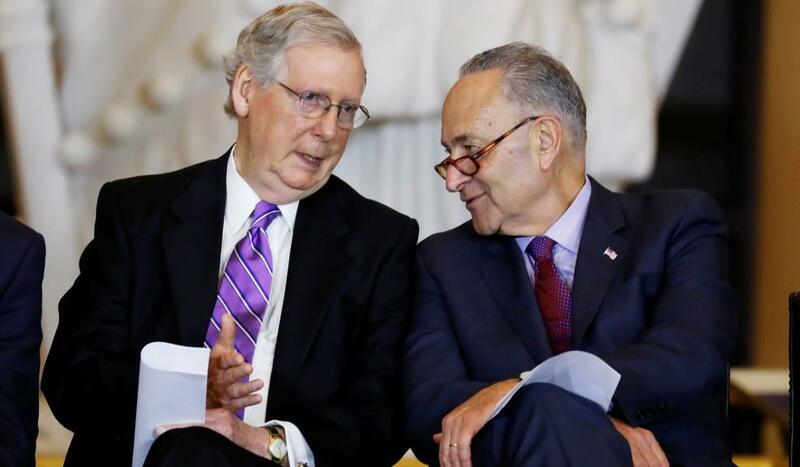 The compromise was reached between Mitch McConnell, the Senate majority leader, and Chuck Schumer, the Senate Democratic leader. Despite a seemingly softened tone, the two bills still face uncertainty in the Senate as each bill would need to garner 60 votes required to advance. The Republicans have long sided with the president and insisted that any legislation to reopen the government include the border wall money, while the Democrats have repeatedly demanded the Congress reopen the government first, and then the two sides could discuss on border security funding. Trump on Saturday proposed extending protections for young people brought to the nation illegally as children in exchange for the 5.7 billion dollar funding for his long-promised border wall, signaling a willingness to break the shutdown standoff. Calling it a "non-starter," House Speaker Nancy Pelosi said in a statement Saturday that the proposal is "a compilation of several previously rejected initiatives." The top U.S. Democrat said the offer was unlikely to gain the votes needed to pass the House. Trump on Tuesday resumed his defense of the border wall. "If we create a wall or barrier which prevents criminals and drugs from flowing into our country, crime will go down by record numbers!" the president tweeted. Pelosi, meanwhile, tweeted Tuesday that the House Democrats will vote this week on "more bipartisan bills to re-open government, and act to bolster funding for border security solutions that work." The record-long shutdown, now in its 32nd day, has affected a quarter of the federal government, forcing about 420,000 "essential" employees to work without pay, and 380,000 others to take unpaid leave.